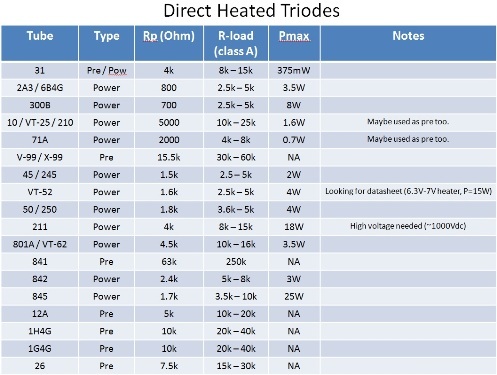 What are direct heated triodes? 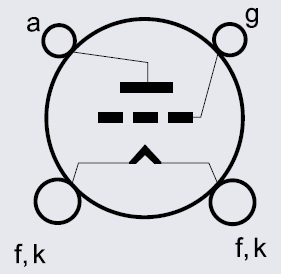 Triodes have 3 internal elements (refer picture below): the grid (g), cathode (f, k) and plate or anode (a). The cathode obtains the energy required to emit electrons from heat, and therefore filament is needed. For directed heated types, the cathode is the filament. For indirect heated types, the cathode and filament are separate elements. There are 3 common materials used: thoriated-tungsten, oxides, impregnated tungsten. The thoriated-tungsten type will give a nice glow like the common light bulbs. Direct heated triodes can be considered the simplest form amplification device, and therefore the best device to use, with minimalism concept in mind, and therefore, the topic on this page. Since this is all about minimalism, I will only touch on class A amplification on this page. Direct heated triodes have a huge following especially in the Japan. I have been addicted too since in the early 2000 when I got up close and personal with the famous 300B vacuum tube. I’ve personally tried quite a number of them, either through DIY projects, or commercial amplifiers, and I can say, you cannot go wrong with direct heated triodes! All of them sounded darn good if you match them in the right setup. 12A, 1G4, 1H4G, 26, 31, 2A3 / 6B4g, 300B, 10 / VT-25 / 210, 71A, 99, 45, 50, 211, 800, 801A, 805, , 808, 809, 810, 811, 812, 833, 813, 842, 845, vt52. Type at the table means whether it can be used as pre-amplification or power amplification. It is not carved in stone though as some have used even the power tube in pre-amplification. Nothing is impossible! The Rp denotes the plate resistance and that determines the R-load, load impedance it should have for optimal performance in a class A amplifier. Pmax is the maximum power achievable with acceptable distortion figure (usually is 5%) for the class A amplifier. To drive real life speakers, at least 0.7W of power output is needed. If you can live with lower volume, then you can consider the 375mW #31 direct heated triodes. For some of the transmitting tubes like 10, 801A, 211, 811, 842 and 845, they can even be driven into class A2 mode to gain more usable output power. These tubes have a special grid that is meant for such jobs and will be able to withstand the grid heat up. Interstage coupled driver to power stage (6BX7 to 801A). 2:1 step down to lower output impedance. 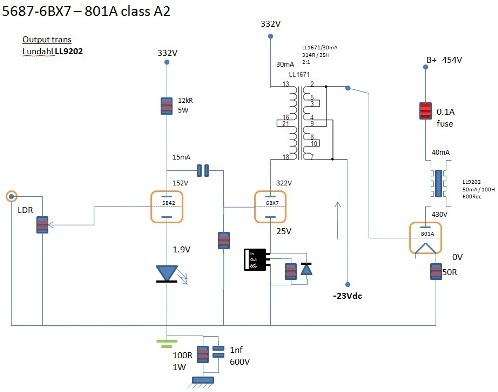 Large voltage swing capability (3-stage) to drive 801A grid positive. Like us at Facebook, bookmark us, subscribe for updates to get to know the latest development of this class A2 801A tube amplifier! Class A2 is achieved when the grid is driven more positive than the cathode. During this time, a certain amount of current is drawn from the driver stage to the grid of the power tube and therefore the driver stage has to be able to supply the current drawn and the voltage swing required to drive the power tube into class A2 operating region. This can be achieved with a low output impedance driver stage using a higher power tube instead of the normally used tubes. What are the good sounding brands for direct heated triodes? There should be no dispute here. 1st tier: Telefunken and Western Electric. 2nd tier: RCA / Radiotron / Cunningham, Tung-Sol, Mullard, GEC, Amperex Holland / Amperex Bugle Boy, Hytron (older ones, some are made for Western Electric), Philips Miniwatt (Holland). 3rd tier: Valvo, Siemens, Hytron (1960’s), Sylvania, GE, Philco, National Union and etc. If budget permits, aim for Telefunken or Western Electric. If not, the 2nd tier ones should be fine too. The above recommendations are just from personal opinions based on the feedback from DIYers and tube enthusiasts out there. The performance might vary from system to system, amplifier to amplifier, tube to tube, year to year, version to version, taste to taste and many other unaccounted factors. Do try it out and let us know what you think about the 3 categories. If you purchased expensive tubes, do remember to consider giving it special treatment – soft start, to prolong the tube lifespan. Go to Soft Start (opens in a new window). What are the general rules of thumb for selecting a better tube, or the best tube for driver, preamp, and power amplifier sections? Below is a guide for your reference. You can’t go very wrong with the recommendations but there are exceptions. There might be some specific selection criteria for some specific tube and it may not be applicable to all. Older version over the newer versions. Ex: 1940’s made 2A3 is better than the 1960’s made 2A3. New Old Stock (NOS) tube over the new production tube. Single plate over dual plate. Balloon over ST (Coke bottle shape), ST over straight glass. Matched constructions and same date code for pairs. Red base over brown base, brown base over black base. Engraved base over printed base. SQ (special quality), aviation, military, special purpose tubes. Lower filament voltage, the lower the better. For vacuum tube experts out there, we’re looking for specific tube recommendations to share with the readers of www.diy-audio-guide.com. We would love to receive recommendations from you. Please drop us an email at the contact us page: Go to Contact Us (opens in a new window). High efficiency speakers in general means speakers that are able to produce a certain (higher than normal) SPL (sound pressure level) with the same amount of power applied. Also, they would need have a flatter impedance curve (as flat as possible), without big dips and peaks as tube amplifier do not like dips and peaks due to the nature of the design. For some speakers that have low /dB/w/m number but with a flat impedance curve, it might work well with tube amplifiers, experiment! Apart from all these, the performance also depends on the listener’s preference, room size, room acoustics, music types and etc. So, take this with a pinch of salt. Hope you enjoy the read. We’ll talk more about how to DIY tube amplifiers with the above direct heated triodes in near future at DIY tube amplifiers. Bookmark us and stay tuned for the next update!